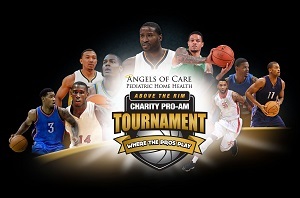 Angels of Care is proud to present, Above the Rim Charity Pro-AM Basketball Tournament. This local 5 on 5 bracket tournament will be benefiting the families that are served by the Ronald McDonald House of Dallas. The tournaments will be from 09:00 a.m. to 08:00 p.m. on Saturday, July 26th and from 10:00 a.m. to 04:00 p.m. on Sunday, July 27th. Championship will be on held on Sunday. Winning team will win $5,000! Everyone will get a chance to watch a few professional athletes which include but are not limited to: Donald Sloan, Alec Burks, Acie Law, and more! Adult: $10 for one day or $15 for two days. Child: $5 for one day or $8 for two days. & other local food trucks!